No one likes to wash or dry dishes, but it is a necessary evil that comes along with cooking and eating. Fortunately, throughout time there has been a variety of devices that were designed to make the process easier. Sure, the dishwasher is ideal for anyone, but not everyone has the funds to invest in one of these machines. If you want a cheaper and more practical alternative, you should consider a dish drainer. You will still have to wash the dishes, but it will make the drying process so much easier. In this guide, we take a look at the best selling drainer rack model and also consider what to look for when making your purchase. If you really want to make you dishwashing and drying tasks much simpler and quicker, you should consider investing in the Joseph Joseph Expandable Dish Rack. The dimensions of this product are 53 x 36.5 x 16 centimetres, but the unique thing is that it can be extended to double almost this size. So, whether you are cooking for a large or small crowd, you will be able to adapt this dish rack to suit your specific needs. Flat dish racks are great, as they look amazing and do not take up a lot of counter space in the kitchen. The only problem is that they have a flat surface, which means that the excess water will get trapped and become a harbour for bacteria and foul odours. This is why the Joseph Joseph Expandable Dish Rack is equipped with raised ribs. This allows the water from glasses and other items to navigate to a spot, where it can eventually be drained into the sink. When it comes to making your kitchen chores easier, you really cannot go wrong the Joseph Joseph Dish Rack. 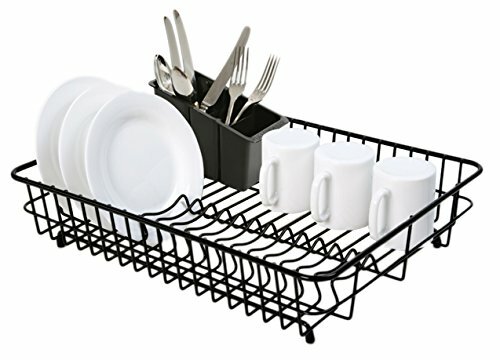 This dish rack not only includes features that are essential to the cleanup, but it makes the entire process easier. 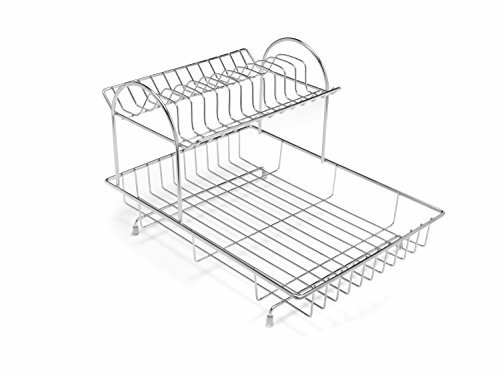 With the chrome plated and stainless-steel construction, the Tower T81400 Dish Rack provides all the durability and stability that any homeowner needs for drying dishes. These materials not only improve the overall look of the kitchen, but they provide the exact amount of water resistant to ensure that the rack will stand up against the harsh treatment of water. One of the most impressive features of the Tower T81400 Dish Rack is that its equipped with a removable plastic drain tray. Plastic is an extremely durable material. It not only repels water, but it contains properties that are capable of resisting rust and corrosion. When water hits this material, it will flow off and navigate towards the drain spout, where it is effectively eliminated. The removable tray can be removed to easily dump any water or waste that is trapped underneath it, which means you can clean up excess waste without removing the dish rack. With the stainless-steel construction, you will not only get durability, but you can ensure that this dish drainer will enhance the overall appearance of your kitchen. Sitting water will never be an issue with this dish drainer, thanks to the removable tray. 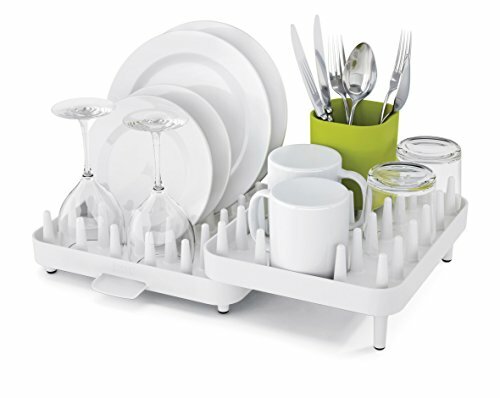 Whether you are the owner of a small or luxurious kitchen, you can really utilize the Joseph Joseph 3-Piece Dish Rack. With its ability to adjust to more or fewer dishes, you can really customize it to suit your specific needs. If you are hosting a small dinner party all you have to do is leave the rack intact. If you are hosting a larger party, just simply extend the rack out and it will accommodate all your guests’ dishes. It really doesn’t matter where or when you are installing the Joseph Joseph 3-Piece Dish Rack. The rack has rubber feet that will prevent slippage, regardless of location or application. The rack will always stay in place even when sitting at an angle. When you combine the non-slip rubber feet with the adjustable racks, you are truly looking at one versatile and convenient dish rack that will suffice in a variety of conditions. 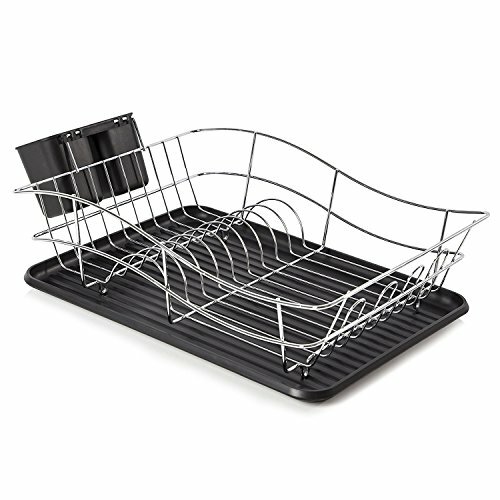 Regardless of your needs, you can benefit from the Joseph Joseph Dish Rack. 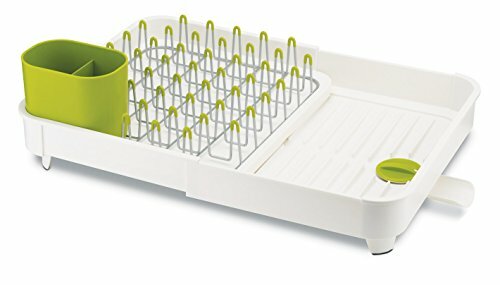 The Addis 2-Tier Drainer might be a simply designed dish rack, but it includes every feature that the average homemaker would need. The two levels provide you with more room and the ability to dry all of your dishes simultaneously. Whether you are looking to dry dishes, plates, or cups, the Addis 2-Tier Drainer gives you the ability to do so. Your counter is an extremely important part of your kitchen. You don’t want foreign materials scratching it up. This would only make it look unattractive and decrease its value. That is exactly why the Addis 2-Tier Drainer is equipped with plastic feet. The feet not only ensure that the rack stays in place at all times, but it protects your countertop against mars and scratches. Whether you are investing in a dishwasher or a dish drainer, you want to know that you are getting your money’s worth. Well, you can rest assured that is what you are getting with Delfinware Dish Drainer. 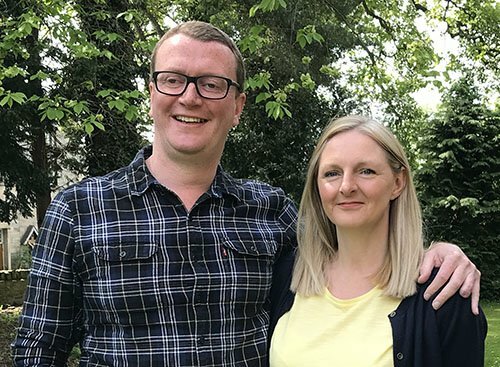 The dish drainer is backed by a one-year guarantee. In the event that something goes wrong in the first year of ownership, all you have to do is contact the manufacturer and they will either rectify the problem or refund your money. Unfortunately, your nightly dishwashing just doesn’t consist of plates and cutlery. While this might make your dishwashing endeavour more troublesome, it really isn’t a problem for the Delfinware Dish Drainer. This drainer includes aspects and features that are capable or draining plates, cups, cutlery, and a variety of other kitchen utensils. 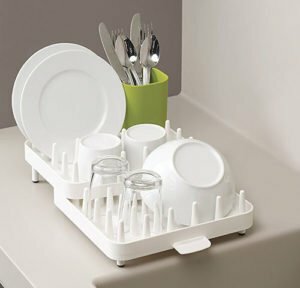 This dish rack might not be compressible or expand, but it provides ample space that the average housewife needs to dry a variety of dishes on a daily basis. With dimensions of 120 x 485 x 380 millimetres, this rack provides just enough space to host the largest of dinner parties. If you are looking for versatility and large size in a dish drainer, you will simply not find anything more accommodating than the Delfinware brand. This drainer not only provides the size to host dinner parties, but its simplicity makes it is easier than ever to use. This dish drainer is suitable for all households, regardless of the size and number of parties hosted. When choosing the best drainer for your kitchen there are a variety of important factors that you need to consider. What are these factors? When it comes right down to it, there are really two basic models of dish drainers available on the market. First, you have the freestanding model. And, secondly, you have the built-in model. Each model comes along with its very own advantages and disadvantages, but when it is all said and done, it is going to depend on your specific needs and preferences. What you really need to know about the two models is that the freestanding unit is pretty much what the name suggests. It stands on its own and can easily be moved from location to location. The only bad things about this model are that it is going to be visible at all times and it will take up sink or counter space, depending on your method of installation. The built-in model on the other must be installed into the countertop, which could require a speciality installation, depending on the application. Even though these models are installed in cabinets, they can really hide your drying dishes and provide you with ample counter space. This might be just the thing that an individual with a small kitchen is looking for. The real problem comes down to the size of the cabinets and the ventilation. Does your cabinet support the proper size and ventilation that is suitable for your drying needs? Areas that are cramped and not well ventilated may alter the drying time and cause mould to grow on your dishes. Unfortunately, your dishes include more than just plates. Plates are flat and skinny, making them easier to clean and dry, but this will not be the only utensil that you are dealing with on a daily basis. You will have to wash everything from the pots to the pans, spoons, knives and even cups. This is why you always need to consider the number of racks that are included with the dish drainer. Most modern holders are equipped with special areas for plates, but they are also equipped with areas that are specifically designed for glasses and cups. You really need to consider the amount and types of dishes you are dealing with on a daily basis. This will help you better determine the amount and types of racks that you need in your drainer.